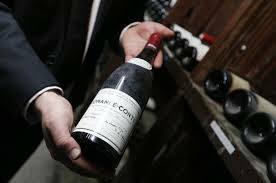 Lot of 114 bottles of Burgundy fetches $1.6m, or more than $14,000 each. An auction in Hong Kong has broken the world record for the most expensive lot of wine ever sold, with 114 bottles of Burgundy going for HK$12,556,250 (£1m, or $1.6m), Sotheby’s has said. The auction house said a collection of Romanee-Conti, one of the world’s most sought after Burgundy labels, sold for the equivalent of $14,121 for each bottle or $1,700 per glass. The lot contained six bottles of each of the 19 vintages made from 1992 to 2010. The previous record for a single lot of wine – also held by Sotheby’s – was $1.05m for 50 cases of top Bordeaux Chateau Mouton Rothschild 1982, sold in New York in 2006.